The Audio Publishers Association Conference (APAC) is an annual event held on the the day before BookExpo America, the largest trade show for the publishing industry. 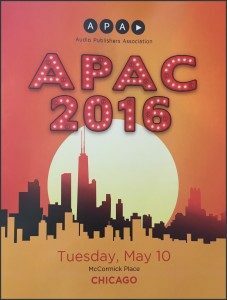 This year, APAC was held in Chicago on Tuesday 10 May. I debated about listing all of the panelists’ names below as I believe in giving credit where it’s due. I decided not to include the names because a main value in attending the conference is to meet and learn from people who are in a position to hire narrators. My freely sharing all that was said and the names and positions of those influential people would not be fair to the narrators who paid the conference and associated travel costs. Instead, I’ll share 3 of my take-aways from the day and offer 2 ideas to help you plan for future similar networking opportunities. 1. Find a way to offer video in support of your brand. Yoel Flohr, a longtime leader in digital media, gave the keynote presentation about the ever-increasing need to incorporate video in support of your brand, whether you’re a publisher or narrator. Surprisingly, I don’t recall that he used any video in his presentation. Instead, he discussed numerous figures about the staggering amount of video content uploaded each day and the number of users and views for several media channels. He stated that half of all usage is mobile. He noted that you should not expect to make money directly from your videos for the next 3 years. However, Flohr maintained that video is the way to stay relevant. He suggested that you super-serve a niche audience. You need to think like a network TV programmer, meaning that posting new content consistently and regularly is crucial for your success. 2. Create and maintain a narrator web site separate from your commercial work. I attended 2 panel discussions of great interest to narrators: Getting To the Next Level, and Ask A Casting Director. Panelists in both sessions made numerous comments about narrator web sites, noting that narrator sites are increasingly important in casting decisions as they show you are a professional performer. All of the panelists prefer to receive links to clips rather than samples attached in email. Make sure your site is responsive on desktop, laptop, tablet, and phone browsers. Include on your site information about your recording environment, language fluency, accents, and musical training. If your site links to your social media profiles, only link to those sites you use professionally, such as LinkedIn. Keep your business and personal content separate. One casting director said it’s easier for them to send an author to a specific sample on your site rather than referring them to a narrator’s profile on Audible. 3. Be a problem-solver, not a problem. Casting directors are extremely busy people. It’s their job to find new talent; they are always hoping to find the perfect person to narrate each book. Be judicious in sending follow-up messages. Unless you have something big to report, every 2-3 months is probably frequent enough contact. Learn how to manage your time so that you are not overcommitted on project deadlines or straining your voice. Respond very quickly with your best read to audition requests from casting directors, but don’t ask for or expect to receive feedback. Here are 2 ideas to help you maximize your future networking opportunities. 1. Set goals for the event BEFORE you go. Between the educational workshops or panels and the individual discussions, a conference quickly can become overwhelming, especially to an introvert like me. When I say I’m an introvert, I don’t mean I’m shy — far from it. I’m introverted in the sense of how I draw energy and process information, as explained in this article in The Atlantic and this one from the Huffington Post. Why only 3 people? First, I research the people I want to meet so I know something about them. In addition, at a conference like APAC with hundreds of people milling about, actually finding the 3 particular people can be difficult! Your number might be different. The important point is to know who you want to meet and actively look for them. I usually meet far more than the 3 people I was seeking, which is always a wonderful bonus! Conferences are also a time to catch up with industry friends. I was delighted to see so many narrators I know from our on-line groups, and I wish I could’ve spent quality time with all of them! 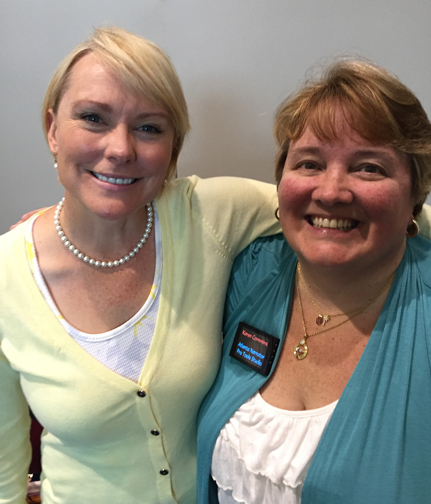 One of my goals this year was to finally meet my friend Ann M. Richardson in person. Ann and I have been partners in writing a monthly column about audiobooks for InD’tale Magazine for the past year. While we’ve had many video chats, we hadn’t actually met in person until this APAC! We started texting early in the day so we could find each other and get a picture together! 2. Remember it’s not all about you. usually in a time and way that you don’t expect. That thought has always compelled me to help others as much as possible, and the Universe returns the energy to me in some other way. While it was exciting to meet the 3 people in my plan, I was very pleased to be able to introduce some people to each other, knowing they would be good connections for each other. I also enjoyed talking with other narrators and giving them ideas about people to contact and projects to undertake. Do you have memories of APAC or networking tips to share? Please leave a comment on the blog! Nice article, Karen. It was great meeting you. You’re 100% correct when you say “go with a plan”. Since this was my first APAC, I kept an open mind and went with the flow. I made about a dozen contacts (hopefully they’ll turn into some business in the future). But next year’s APAC already has me jotting down ideas in a notebook so I’m much better prepared. Hi, Marie! I enjoyed meeting you at APAC and appreciate your comment. Meeting people at these sorts of events is like planting seeds. You have to nourish the relationship in order for it to grow and bear fruit. I’m glad to hear you’re already planning for next year! In fact, some of those ideas you’re jotting down now may even inspire some of your follow-up actions with the people you met this year. This was my first APAC, too, and I have to agree with Marie that I decided to ‘go with the flow’, also, since it seemed a bit overwhelming. I know I’ll have a better idea of what to expect the next time I attend. Hi, Lee Ann! Thanks so much for your nice note! I had hoped to talk with you more that day as well. At least we can stay in touch on-line! Awesome blog post my friend! Thanks so much, Ann! I love our picture together, and a highlight of the day was finally meeting you in person! Even the sky is no limit for you, my talented friend! Great piece, Karen! You were certainly on my list of folks to meet at APAC. Keep on writing, my friend, and I’m looking forward to your book, because you need to write one! Hi, Richard! We’ve crossed paths on-line so many times that the Universe realized we finally needed to cross paths in real life! I was so happy to finally meet you, and I have particularly appreciated our follow-up discussions. Thanks for the encouragement about the book. I actually am working on one! Great article, as usual! Thanks for your insightful report. It was great to see you again at APAC. I think I managed to chat to you more than once, although sitting at the lunch table in that VERY noisy room couldn’t exactly be counted as a conversation. None of us could hear each other. Haha. When I think of how many people were there, I feel a bit amazed and very blessed that I was able to find and at least say hi to so many friends in the crowd. See you next year (if not sooner)!